MEF18 | VIAVI Solutions Inc. Whether Your Network is Physical or Virtual – the Need for Testing is Real. From the wired networks of today to the self-provisioning networks of tomorrow, VIAVI helps network service providers improve the customer experience while reducing operational costs. 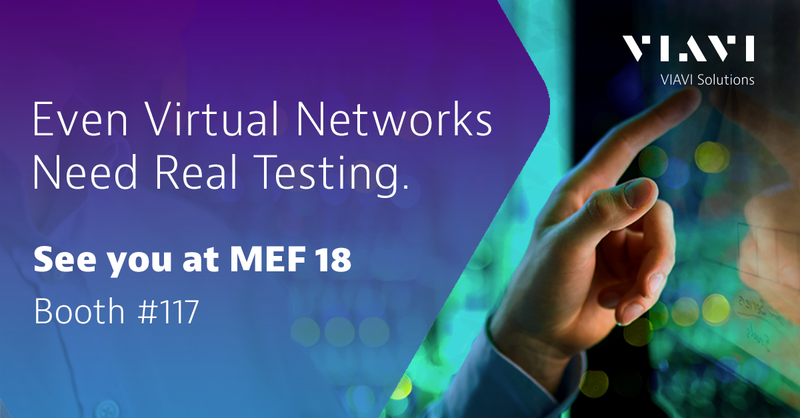 Come see how at MEF18, where we’ll have test and measurement experts and demonstrations of our high-performance network test solutions, both hand-held and virtual. Fusion, a virtual test software platform, that helps resolve customer throughput complaints from a call center, reducing truck rolls. MAP-2100, a rack-mounted 100G, centralized test-head that turns a two-man network test a solo job. We can help you maximize operational efficiency and bridge the gap between your legacy network and the virtual network of the future. Contact VIAVI to set up a meeting or demonstration.